Camp Este, sometimes called Nemo, was located 2 miles south and 1/2 mile west of Nemo on the south side of road 208 where it crossed Estes Creek. The stream flowed the length of the camp nestled among the high pine-covered hills, only 1/4 mile from Custer's trail (1934). Originally it contained 20 buildings--six 32-man barracks, headquarters building, recreation hall, supply building, mess hall, bath house, hospital, laundry, foremen's quarters, army officers' quarters, two garages, cooks' quarters, blacksmith shop, and small pump house (1934). 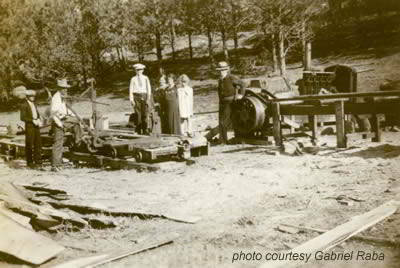 The first camp organized in South Dakota, it was located at the site of old "Este" logging camp which sawed lumber from the first timber sale made the U.S. Forest Service in the United (BHE). The camp was established May 18, 1933, and closed July 28, 1942 and was home to Company 789 -- 5/18/33-1941 and Company 2759V --1941-7/28/42. Transportation was in 30 to 35 old wire-cage Liberty trucks that had been transferred to the army from the Post Office Department and driven from Fort Snelling, MN. Five or six men and their duffel bags were loaded into each "bird cage," as they were called. Other trucks were used to haul tents, equipment, and other provisions for camp. An army sergeant blew the whistle and the army drivers, with their cargoes, left a crowd of interested spectators. Enroute to Este the leading trucks took the wrong road and had to turn around on a narrow dirt road (BHE-37). Lt. Busbey and Sgt. Sears arrived on the camp site about 9 o'clock in the morning. They arranged the camp site. At 11:30 the trucks with the men arrived. The army mess sergeant had what looked like a truck full of sandwiches ready. By night the tents were up, the army cook had a hot meal ready, and the camp was ready to operate. The next morning, with the help of the forest service personnel, a road, bridge, and culvert were constructed to the main highway, a fire line was constructed about the camp, and the ground cleaned and policed (1934). An average day for the enrollees began at 6 0'clock in the morning. 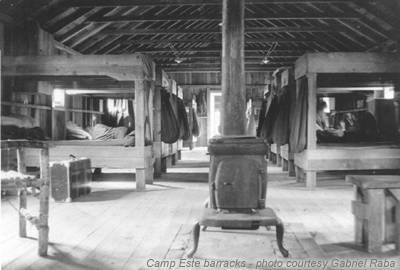 After breakfast the men made their "bunks" and cleaned their barracks so that they were ready for inspection at any time. At 7:30 they left camp for work in the forest (1936). 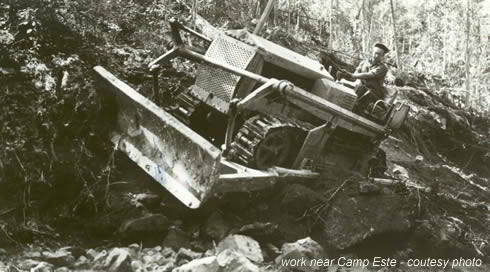 A forestry foreman was in charge of each crew and the work was an assortment of thinning trees, building roads and trails, stream improvement, dam construction, and camp ground development for tourists (1935). At 3 o'clock in the afternoon they returned to camp, and the rest of the day was devoted to recreational and educational activities (1936). Lake Dalton Dam was constructed in 1933, the adjacent camp ground in 1934, the nearby ski course in 1935, Box Elder Fork camp ground in 1933, and Steamboat Rock camp ground in 1934 (1934-1936). The White-Gates road was constructed in 1934 and improved in 1937 and the Merritt-Este road in 1937 (1937). The ranger station was built in Nemo and two houses remodeled for rangers' living quarters. Thinning, timber-stand improvement, and road construction were the most important work projects during the winter months (1937). 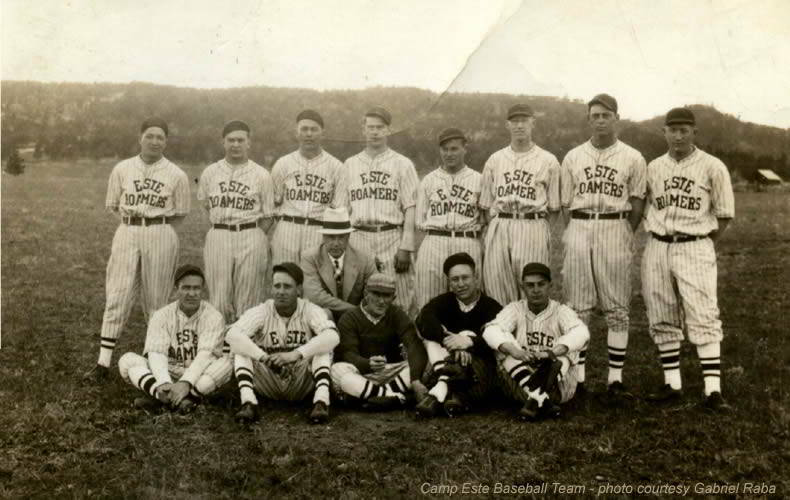 Camp Este was proud of the fine record established by its baseball team in 1935. On the average, two games a week were played. Aside from their CCC league opponents, games were scheduled with some of the best independent teams in the Hills (1936). The boys won 19 games before they suffered their first defeat. With a record of 20 wins and 3 losses the Camp Este nine finished second in the Black Hills CCC tournament, losing the final game to Wind Cave, a team they had subdued quite easily earlier in the season. This was the only game that was lost to a CCC opponent all season (1936). The team was weakened during the latter part of the season by the loss of two stars. Before they left, the Este infield was considered the best in the Black Hills. In the first game played with the State Cement Plant nine, the team that won the Rapid City championship and was considered one of the best in the Black Hills, the boys from Este emerged victorious by the over whelming score of 18 to 4 (1936). 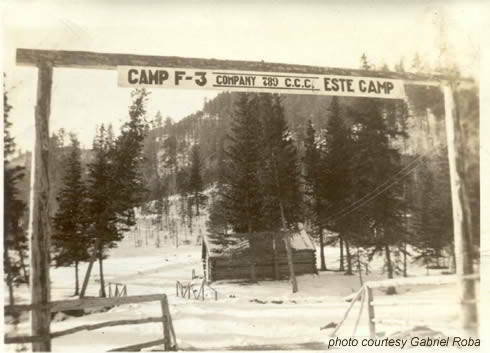 Este was the first South Dakota camp opened and one of the last closed. 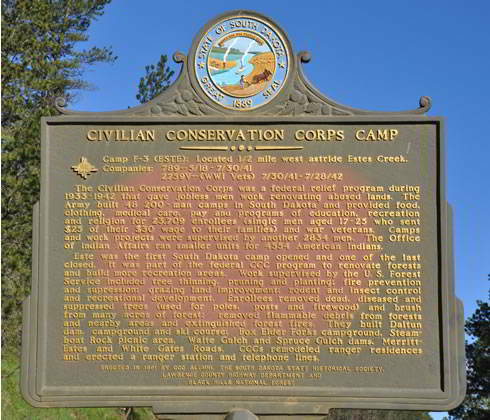 It was part of the federal CCC program to renovate forests and build more recreation areas. Work supervised by the U.S. Forest Service included tree thinning, pruning and planting, fire prevention and suppression, grazing land improvement, rodent and insect control, and recreational development. Enrollees removed dead, diseased and suppressed trees (used for poles, posts and firewood) and brush from many acres of forest, removed flammable debris from forests and nearby areas and extinguished forest fires. They built Dalton dam, campground and ski course, Box Elder Forks campground, Steamboat Rock picnic area, Waite Gulch and Spruce Gulch dams, Merritt-Estes and White Gates Reads. 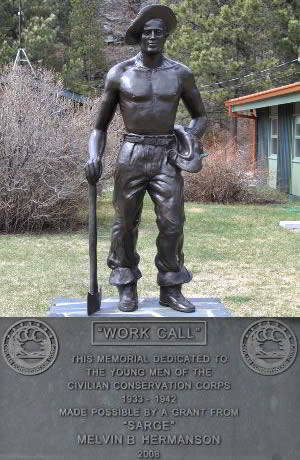 CCC's remodeled ranger residences and erected a ranger station and telephone lines.